The Atlanta Falcons had a new head coach and quarterback for the 1994 NFL season as they opened against the Lions on September 4. Offensive coordinator June Jones had succeeded Jerry Glanville as head coach following a disappointing 6-10 season in ’93 and they picked up QB Jeff George from the Colts to operate their version of the run-and-shoot offense. The Lions, coached by Wayne Fontes, were also debuting a new quarterback in Scott Mitchell, a highly-regarded (but not much experienced) backup in Miami who was signed to a big free agent contract. 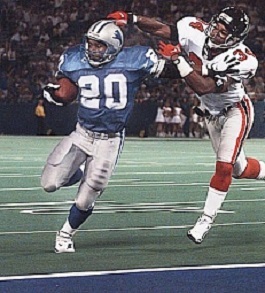 Star RB Barry Sanders (pictured above) had missed five games late in the previous season but was ready for the new one (and would not miss another game for the remainder of his illustrious career). Herman Moore was a rising talent at wide receiver. There was a crowd of 60,740 present at the Pontiac Silverdome. The Falcons had first possession and punted. Following a 22-yard return by WR Mel Gray that gave the Lions good starting field position at their 47, it took just three plays for the home team to get on the board. Mitchell threw to Herman Moore for a 34-yard gain, Barry Sanders ran 18 yards, and RB Derrick Moore gained the last yard for a touchdown and, adding Jason Hanson’s extra point, a 7-0 lead. That was it for the scoring in the opening period. The teams traded punts until the Falcons went 58 yards in eight plays in the second quarter. Keeping the ball on the ground, the big play was a 25-yard carry by RB Erric Pegram who also finished the drive off with a one-yard touchdown run. Norm Johnson’s extra point tied the score. Neither team was able to get out of its own end of the field for the remainder of the period as the score remained 7-7 at the half. The Lions started off the third quarter with a seven-play, 70-yard scoring drive. Sanders ran effectively, gaining 26 yards on three carries, and a pass interference penalty picked up 18 yards to the Atlanta four yard line. From there, Mitchell passed to Herman Moore for a TD. The Falcons responded with a long drive of their own. Jeff George completed 10 straight passes in the 12-play possession that covered 80 yards including the last to WR Andre Rison for a two-yard touchdown. The game was again knotted with the offenses having come to life. Detroit was on the move as the period ended and, early in the fourth quarter, Mitchell connected with WR Anthony Carter for a nine-yard TD. It capped a 12-play, 76-yard series and gave the Lions a lead that didn’t last long when, on the first play following the ensuing kickoff, George threw to Rison for a 69-yard touchdown. The Lions went three-and-out on the next possession, which forced the first punt of the second half, and Atlanta rolled down the field on a long drive that covered 78 yards in 12 plays. Three times George converted third downs on passes to Rison, the first for 28 yards in a third-and-seven situation, the second gaining 17 yards on a third-and-12 play, and the third picking up 9 yards while facing third-and-four. It was WR Terance Mathis finishing the series off with a touchdown on a 15-yard scoring pass from George. The Falcons were ahead by 28-21 with just under four minutes remaining in regulation. Following the kickoff the Lions took possession at their 35. The first two plays gained nothing but, facing third-and-10, Mitchell hit Herman Moore for 11 yards. Two plays later he threw to Carter for 14 yards. Two short gains and an incomplete pass had the Lions in a fourth-and-one situation at the Atlanta 31 with 54 seconds on the clock. Mitchell completed a pass to TE Rodney Holman for 16 yards and two plays later connected with Carter for a 15-yard touchdown. Hanson added the all-important extra point and the score was once again even at 28-28. 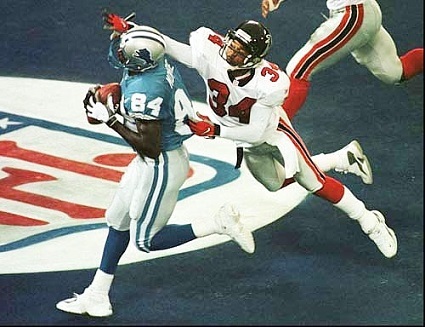 The Falcons had one last shot in regulation and, following the return of the squibbed kickoff by safety Alton Montgomery to the Atlanta 44, two completions to Rison got the ball to the Detroit 34, but a field goal try by Norm Johnson from 52 yards sailed wide to the right and the contest went into overtime. An added concern for the Lions heading into OT was that the placekicker Hanson had gotten hurt making the tackle on the kickoff following the game-tying touchdown. He suffered a cramp in his leg that had trainers working on him afterward. Atlanta got the ball first in OT but was forced to punt after a short series. Starting with good field position at the Falcons’ 49, Mitchell threw to WR Brett Perriman for 30 yards and, following three runs by Sanders, Hanson, despite being in apparent pain from his injury, kicked a 37-yard field goal at 5:14 into the extra period. Detroit won by a final score of 31-28. Atlanta had the edge over the Lions in total yards (389 to 352) and first downs (22 to 21). There was only one turnover, which was suffered by Detroit, although the Falcons were penalized 10 times at a cost of 90 yards against a total of five flags thrown on the Lions, for 40 yards. Scott Mitchell completed 16 of 31 passes for 203 yards and three touchdowns with one intercepted. Barry Sanders rushed for 120 yards on 27 carries. Herman Moore (pictured below) caught 6 passes for 84 yards and a TD while Anthony Carter, a veteran newcomer to Detroit following nine seasons with the Vikings, contributed 5 receptions for 61 yards and two scores. For the Falcons, Andre Rison had a big day as he pulled in 14 catches for 193 yards and two touchdowns. Jeff George was successful on 29 of 37 throws for 281 yards and three TDs with none picked off. Terance Mathis added another 8 receptions for 63 yards and a score. Erric Pegram led the ground game with 23 carries for 91 yards and a TD. The Lions went on to finish third in the highly competitive NFC Central with a 9-7 record. All three Wild Card spots went to teams from the division and the Packers defeated Detroit in the first round. Atlanta ended up third in the NFC West at 7-9. Scott Mitchell had a rough first year in Detroit as he injured his shoulder in the season’s second game and was lost for the rest of the way in Week 10. He completed just 48.4 percent of his passes for 1456 yards with 10 touchdowns and 11 interceptions. Barry Sanders continued to be outstanding, leading the NFL in rushing with 1883 yards. Herman Moore caught 72 passes for 1173 yards and 11 TDs and was selected to the Pro Bowl for the first of four straight years. 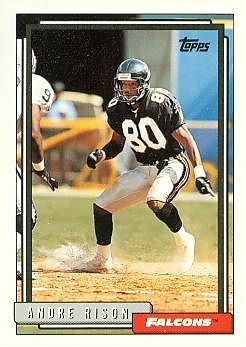 Andre Rison didn’t go to the Pro Bowl but had 81 pass receptions for 1088 yards and eight touchdowns. Terance Mathis did get selected as he pulled in 111 passes for 1342 yards and 11 TDs. Jeff George completed 61.5 percent of his throws for 3734 yards and 23 touchdowns against 18 interceptions.